Funny how universal it is for people to feel peace outside. It&apos;s programmed into human nature: we feel drawn to the open outdoors, especially after a tough day at work. Nature recharges us, refreshes us, puts things in perspective. It almost feels like instinct, and maybe it is. Studies show nature has profound effects on the human brain. 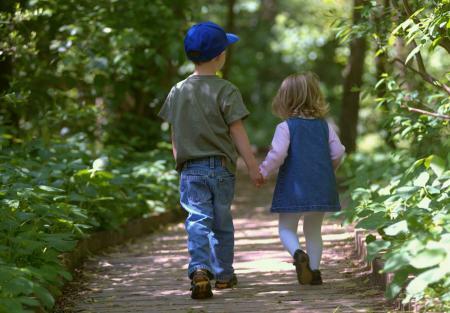 Spending time outside is scientifically proven to make us more creative, smarter, and happier. That&apos;s why our recommended ways to de-stress after work all involve the outdoors. In Dunwoody, Georgia, where green space is plentiful and open skies are everywhere, we call it getting #OutsideAtlanta. But you can de-stress outside wherever you are. Keep reading to find out how, and let nature&apos;s healing begin. We&apos;ve never heard anyone say "Well, that picnic was stressful." A picnic is the perfect way to slow down and enjoy a leisurely few hours for yourself. Plus, it&apos;s easy. Just take what you&apos;re already doing or eating inside and bring it outside. If you have time to plan a more polished picnic, follow our Outside Atlanta Picnic Planning Guide. Then spread your quilt out under the open blue sky, listen to the chirping birds and buzzing bees, and let the sunshine restore your soul. 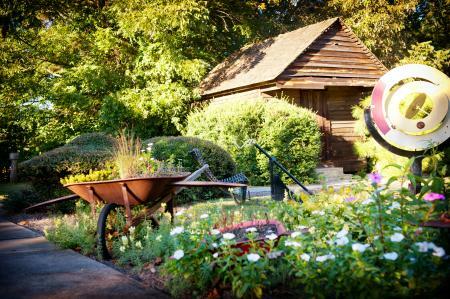 Prime picnicking places in Dunwoody: Head to one of Dunwoody&apos;s many parks. Or if picnicking is too wild for you, patio dining counts too. This is another indoor activity that transitions well to the outdoors. Just grab your favorite book, head to the park, find a hammock, a chair, a stoop, a pile of dirt, whatever. Sit there and get swept into a story til the sun does down. You&apos;ll be feeling inspired again in no time. 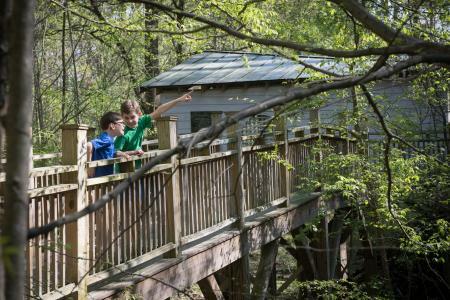 Recommended reading spots in Dunwoody: If you&apos;re in Dunwoody, find the Dunwoody Nature Center for hammocks, tree swings and all kinds of sunny reading spots. "At the end of the day, we come out in nature not because the science says it does something to us, but because of how it makes us feel." - David Strayer in National Geographic, "This Is Your Brain On Nature"
Sometimes it feels like there are two options when it comes to exercising outdoors: Go for a run or feel guilty about not going for a run. That&apos;s just silly. Running (or hitting the gym, doing a work-out video, whatever you call your daily exercise) is great, but walking is better than doing nothing. In fact, some studies show that walking is actually better for you than running. So whether or not you&apos;ve had a long workday, put on a podcast and take 30 minutes to walk a trail at the park or do laps around the block. Your brain and body will thank you for it. Where to Walk in Dunwoody: We have 170 acres of public parks for walking, and plenty of sidewalks (and the 2nd largest mall in the Southeast!) for strolling. Recommended podcasts: Listening to a great podcast makes time fly for any activity (try it while cooking! While cleaning! While grounding your child for coming home at 2 a.m. from that other misguided youth&apos;s house!). Radiolab, The Heart, and You Made It Weird are a few of our favorite podcasts. "City dwellers who visit natural environments have lower levels of stress hormones immediately afterward than people who have not recently been outside." - New York Times, "How Walking in Nature Changes the Brain"
The best way to be one with nature is to literally stick your hands in it. Plucking weeds and tilling soil is one of the most rewarding activities out there, especially when you see those little sprouts peeking up above the dirt. We Have a Dunwoody Community Garden: If you&apos;re not ready to start your own (we know it&apos;s a big commitment) join Dunwoody&apos;s Community Garden in Brook Run Park at 4770 N. Peachtree Road to make friends and grow organic plants and even support those in need. You&apos;ve heard people talk about "pounding it out on the pavement" or how all their troubles just melt away when they&apos;re running or boxing or barrel racing. Well, we feel the same way when we&apos;re eating a particularly delicious hamburger, so maybe there&apos;s something to it. Try an activity that gets your blood pumping and those endorphins firing - run some springs, climb a rock wall, call your mother-in-law. Nothing distracts from work woes and helps you sleep better at night than doing hard physical labor. 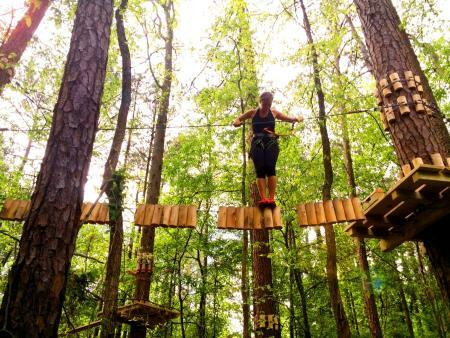 Where to get the adrenaline going in Dunwoody: Head to Treetop Quest, an exhilarating obstacle course that takes you zipping, climbing and swinging through the treetops of Brook Run Park. Or take a bike ride through one of our many parks. "...Strayer has found time in nature - sans cell phone - to be a powerful antidote to the constant distraction of our digital lives. More than that, it enhances higher-order thinking, restores attention, and boosts creativity." - Outside Magazine, "The New Science of the Creative Brain on Nature"
This is more like it. Just relax, lay back and find cloud animals in the sky until you drift off into dreamland. You&apos;re getting sleepy....Verryyyy sleepy...Now when we snap our fingers, quack like a duck. Oh, you&apos;re awake? Just kidding. 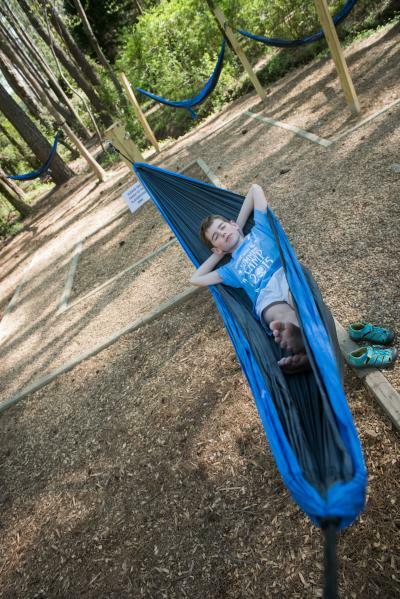 Where to get some ZZZs in Dunwoody: Find that hammock from #2 above or spread out on your picnic quilt (see #1). Inside or outside, this is a surefire way to chill out and release tension after work. If you can only get so far as child&apos;s pose or maybe just the fetal position, that&apos;s OK too. 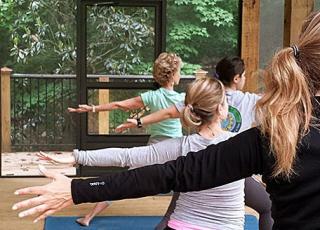 Where to do yoga in Dunwoody: Sign up for a class at Infinity Yoga or keep an eye out for the Dunwoody Nature Center&apos;s Yoga in the Park events on our calendar. We know it&apos;s hard to shut off sometimes. Now and then things are so hectic that you really can&apos;t see a way to take a break and still meet your deadline. If that&apos;s the case, find a compromise: Work outside! Take your laptop to the park or even your back porch, then get back to work. This article says that even being in the presence of green space, whether or not you interact with it, is good for the brain. Those are eight best ways we know to decompress after work. But when the emails are piling up higher than the stack of reports on your desk, it may feel like nature&apos;s not going to cut it and the world might be ending and your ex was right about you being a slob who&apos;s never going to amount to anything and did you remember to turn the curling iron off this morning? But the truth is, work is just work. It&apos;s not your identity. It&apos;s not the meaning of life. So when it&apos;s been a bad work day and you need a simple reminder to chin up, drive by Spruill Gallery in Dunwoody and take a look at our iconic sign. 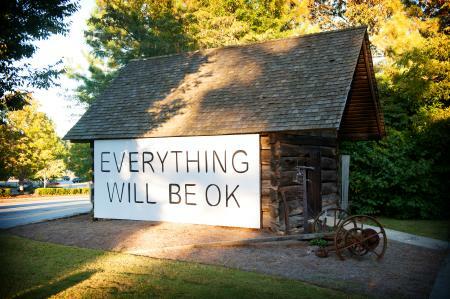 Everything Will Be OK.
Request a Dunwoody Visitors Guide to plan your trip. Like us on Facebook to stay updated on what&apos;s happening around town. Plus free jokes! Share this article with frazzled work friends who might need it. You can copy the link and email them, or just post it on Facebook and Twitter and tag their names. Now shut off your phone or computer and get outside!